The Cachet Table Lamp is a true amalgamation of sculpture and function. This table lamp features a cast metal base with an Aged Iron finish, Antique Brass detailing and a Linen shade. Natural stone and strong architectural geometry pair harmoniously in the Pietra Table Lamp. 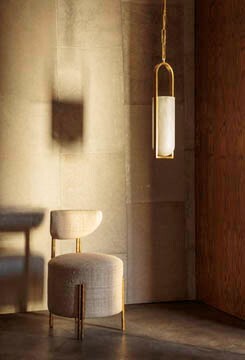 This lamp features a cast limestone base, Antique Brass detailing and is available with either a white linen or Antique Brass shade with matching Brass diffuser.